Volcanic eruptions are something of a spectator sport today, with orbital satellites and high-speed connectivity bringing glorious images of the planet’s pyrotechnic power to the comfortable safety of our computer screens. But a fascinating new study suggests people have been chronicling Earth’s powerful outbursts since long before modern technology. 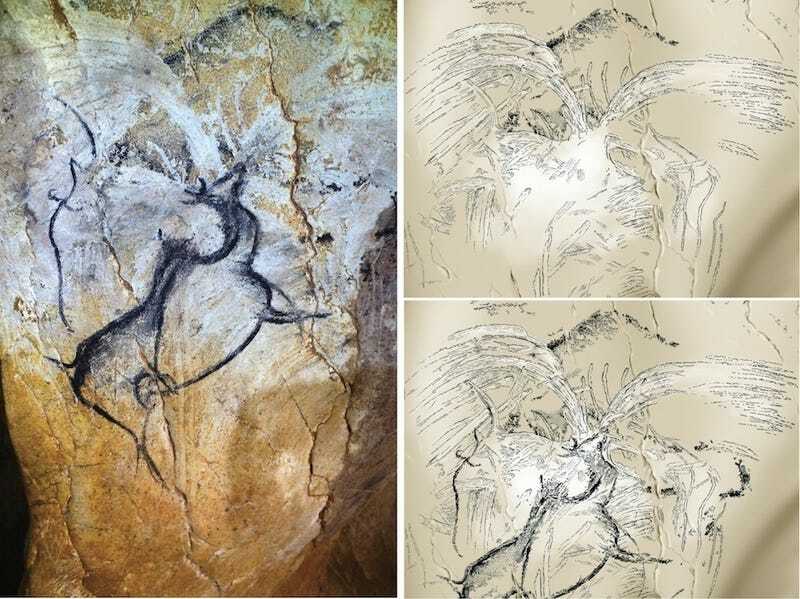 Indeed, it’s possible that we’ve been documenting volcanic eruptions for nearly 40,000 years, according to evidence uncovered in Chauvet-Pont D’Arc, France, one of the oldest and most celebrated cave art sites on the planet. Best known for its depictions of fierce Neolithic beasts, the cave also contains a series of faint, one-of-a-kind spray-shaped drawings. According to a study published this month in PLoS One, these are likely to be the oldest human records of volcanic activity — by a wide margin. The paintings in question reside in Chauvet-Pont D’Arc’s famed Megaloceros gallery, which gets its name from prominent charcoal drawings of a giant deer species hunted by Palaeolithic Europeans. Using radiocarbon dating, archaeologists previously determined that the Megaloceros artworks are between 36,000 and 37,000 years old, meaning the fainter eruptions drawn behind them are at least that old. To see whether this age lines up with any nearby volcanic activity, geoscientist Sebastien Nomade from the University of Paris-Saclay travelled to Bas-Vivarais, a now-dormant volcanic field that lies a mere 21 miles (35 km) away. Lo and behold, Nomade found something very interesting. When his team sampled rocks from three different volcanic centres and used argon isotope dating to determine their ages, they uncovered evidence for repeated volcanic eruptions, occurring between 19,000 and 43,000 years ago. If people were living in Chauvet-Pont D’Arc when Bas-Vivarais erupted, they could hardly have failed to notice. “Our work provides the first evidence of an intense volcanic activity between 40 and 30 ka [40,000 and 30,000 years ago] in the Bas-Vivarais region, and it is very likely that humans living in the Ardèche river area witnessed one or several eruptions,” the authors write.